A well-known PWD media advocate and Publisher of Philippine Daily Inquirer, Atty. 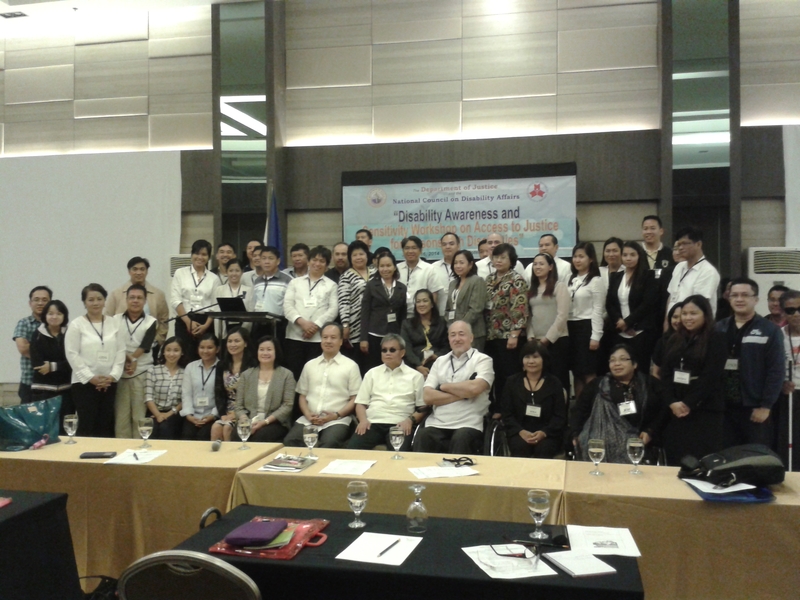 Raul Pangalangan explained to the participants composed mostly of lawyers about the Rights-Based Approach for Equality of PWDs. He differentiated impairment from disability, explaining the impairment means “any loss, diminution or aberration of psychological or anatomical structure or function” while the latter means “resulting from the interaction between persons with impairments and attitudinal and environmental barriers that hinders their full and effective participation in the society. He also explained the characteristic of every PWD witness and how to handle them. In his speech, he gave examples of cases involving PWDs to give light to lawyers. He urged the them to focus on what PWDs lack compared to full-abled persons and to how they prevent PWDs from the full exercise of the legally protected rights. Atty. Reynaldo Reyes, Corporate Secretary of Down Syndrome Association of the Philippines, was the speaker on “Assisting Persons with Learning and Cognitive Impairment”. Atty. Reyes said that Down syndrome, autism, ADHD, etc. counts as one of the intellectual disabilities. Persons with intellectual disabilities have signs and symptoms of intellectual disability that are all behavioural, which is characterized by significant limitations in both intellectual functioning and in adaptive behaviour. In the later part of his speech, he shared his family’s journey with his daughter, Clara. He shared how Clara was like an angel sent from heaven and is a blessing to his family. In turn, he introduced her to the participants. Other speakers are Dr. Liza Martinez on Assisting Persons with Hearing Impairment, Ms. Milagros Wayno for Persons with Visual Impairment, Atty. Rodolfo Quimbo for Persons with Mobility Impairment, and Ms. Janice Cambri for Persons with Psychosocial Disability. About the author. Raphael Torralba is the Program Coordinator of ASP and its resident photographer. He is a former media photojournalist and a graduate of Bachelor of Science in Business Administration Major in Computer-Based Information Systems. His advocacy to serve the PWD community has been recognized by the National Council on Disability Affairs. Raph's youngest brother, Patrick, is on the spectrum.